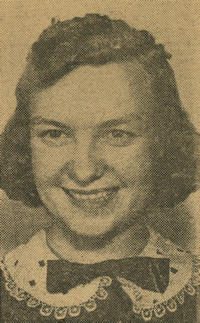 Obituary – Smith, Loleta “Lou” Kathleen (Hopper) « Perry High School Alumni Association, Inc.
– age 17 years, daughter of Mr. and Mrs. J. M. Hopper of Perry, was born at Wirt, Okla., and attended school at Purcell and Stillwater before moving to this city with her parents, three and one-half years ago. She has been vice-president of her home room during the junior year, and a member of the student council that same year. She also belongs to the Order of Rainbow and Queen Esther. Loleta appeared in both the junior and senior plays, and has taken part in mixed chorus and band for six years. She received a student council honor pin and received a band letter for four years’ service. Loleta played this past year in the saxophone quartet at the tri-state meet and had played in the same quartet for two years prior to that. She plans to attend a business school next year. 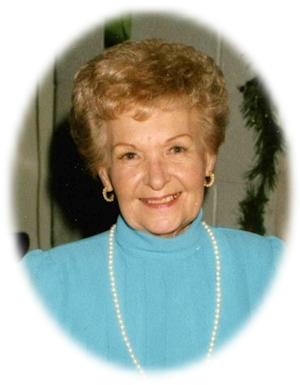 Loleta Lou K. Smith, 84, of Oklahoma City, Oklahoma was the daughter of James M. Hopper Sr. and Myrtle G. West Hopper. She was born April 17, 1923 in Wert, Oklahoma and died Monday, January 21, 2008 at Mercy Hospital in Oklahoma City, Oklahoma. In 1973, she and B.C. Smith were married. He preceded his wife in death. Lou worked as a legal secretary before retirement. She enjoyed playing golf, playing bridge, making candy and ceramics and spending time with family and friends. She was a member of All Souls Episcopal Church and a long-time member of the Twin Hills Golf and Country Club. Funeral services will be at 2:00 p.m. Friday, January 25, 2008 in the Brown-Dugger Funeral Home Chapel in Perry, Oklahoma. Brother Aaron Summers will officiate. Interment will be in Grace Hill Cemetery at Perry. Services are under the direction of Brown-Dugger Funeral Home. Memorials may be made to the American Cancer Society, the American Heart Association or the Oklahoma Medical Research Foundation in care of Brown-Dugger Funeral Home, 1010 N. 7th Street, Perry, Oklahoma 73077. Lou is survived by six nephews, James M. Hopper III and his wife, Rebecca, of Plainfield, Indiana, Hubert Bud Hopper and his wife, Jody, of Fairland, Indiana, James Rodney Ford, of St. Louis, Missouri, Steve Ford, of Speedway, Indiana, Mark Ford and his wife, Tunee, of Ohio, and Rick Ford and his wife, Donna, of Florida; four nieces, Debbie Bryant and her husband, Ron, of Milltown, Kentucky, Betty Lou Williamson and her husband, Ken, of Temple, Texas, Janet Thurman and her husband, David, of Fairland, Indiana, and Patricia Fitz and her husband, Terry, of Shelbyville, Indiana; and numerous great-nephews and great-nieces. In addition to her husband, B.C., she was preceded in death by her parents, one brother and one sister.